It is not uncommon that in a long relationship, family members will go into business together or even set up a series of businesses. Sometimes these businesses involve the adult children in the family and quite often they involve a complicated web of corporate vehicles. Examples of family business structures we have dealt with often include monies invested by the in-laws and also monies invested by the children. At its simplest, this may be a partnership or limited company where different amounts of money have been invested over the years. At its most complicated, ten to forty separate companies in separate countries may have been set up and the various different members of the one family may hold numerous different directorships, interests or shares in the different companies. This makes it all the more important to establish the value and ownership percentages of different members of the family at an early stage. Sometimes the correct approach is to use an independent expert to establish an agreed value of the company or corporate group. Coming to an appropriate settlement may involve having other family members “intervene” in proceedings to protect their interests in the family businesses. Similarly, in-laws or other interested parties may do the same. Discretion and confidentiality may also be important if, for example, one of the family businesses is publicly listed or has outside investors or stakeholders. It is possible to obtain orders or agreements on confidentiality if this is required. 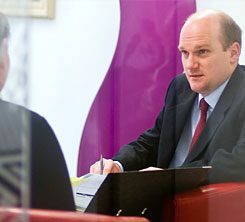 The Family Court can also make a wide range of orders which extend to and include companies as well. In some proceedings a separate company series of orders and agreements may also be reached in separate specialised courts if it becomes necessary. We recommend considering and weighing up all the options carefully before proceeding. If you have some family business interests that you wish to protect we recommend you contact us. See also our problem scenario below. Mr B happens to be the brother-in-law of Mrs A who is involved in bitterly contested divorce and financial proceedings. Mr B is worried because he invested in one of the properties that is part of Mr B’s property development business. He understands that Mr and Mrs A are negotiating to sell assets from the business to fund Mrs A’s settlement. He wants to know what we can do to protect his interest in the property. We recommend to Mr B that he “intervenes” in proceedings. Mr B does so and this protects his investment. Mr B’s intervention provides clarity and this narrows the issues in dispute.